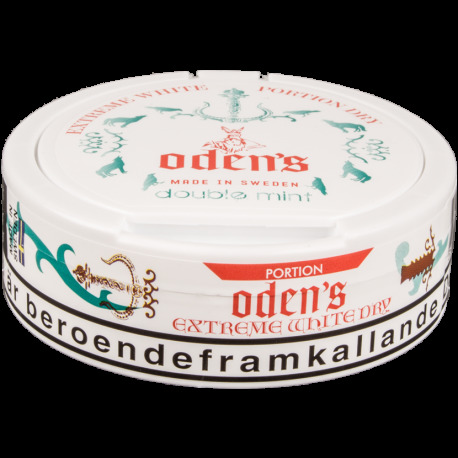 Oden's Double Mint Extreme White Dry Portion combines a variation of mint flavors into one - enjoy the very fresh taste and a prolonged nicotine release which comes on slowly but strongly! First off, why 14 portions per can? Jack it up to 20 and maybe this will go in my rotation. Now on to the flavor - A nice non-sweat minty flavor with a cooling effect. Portions are plump, dry and of good quality. No busted portions in can and portions stay together when you fluff them. 4 stars for 14 portions per can, lolz. At first I was not impressed at all with this but after about 30 minutes it really kicks in and after that it is great,nice strong nic hit and excellent flavor,not a dull flavor like the non white version. Just received my order today and the taste of this snus is amazing, a must have for any mint fan. The taste will knock your socks off! Sorry,meant to give this snus five stars! Just got this today...love it already...very different mint flavor from the other cold dry versions,more peppermint,which I love...if they ever make this in a medium strength version,I probably would use that and this one exclusively, hard to explain,but this flavor is amazing,could also be the menthol,but the flavor is outstanding!being an xtra strong it can knock your socks off,but great snus overall..if you like mint,you have to give it a try..